An Indian chutney is a condiment that usually has a sweet-and-sour flavor that is sometimes spicy. They can be made with fruits and vegetables, and eaten fresh, or bottled for longer storage by processing in a hot water bath. 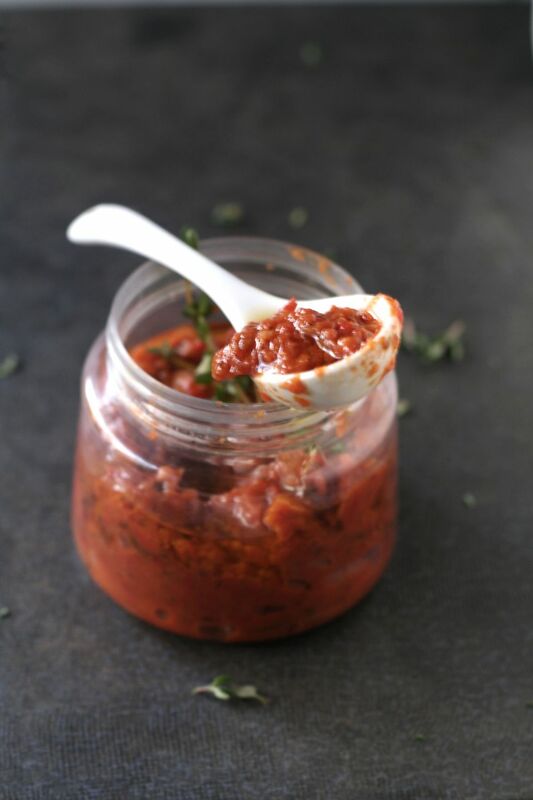 This Indian tomato chutney is known as kasundi and is the perfect recipe for a bounty of fresh tomatoes. It is made with spices, vinegar, sugar, and hot chilis. Directions are given for longer storage but if you want to eat it fresh, the chutney should be stored in an airtight container in the refrigerator and consumed within two weeks. Serve this relish with hot or cold roasted meats, vegetables, bread, crackers, cheese, as a sandwich spread, on a green salad, or with a meal of daal and fragrant, long-grained basmati rice. In a non-metallic bowl, soak the mustard seeds overnight in the malt vinegar. If you plan to can the chutney, prepare five 1/2-pint canning jars, rings, and lids for storing your kasundi, by sterilizing them in boiling water. Let them air dry thoroughly and keep ready to use later. Boil a large pot of water over medium heat. While it is boiling, cut the skin on the bottom end of each tomato with the tip of a sharp knife, in a cross shape. Do not cut deep, only through the skin. When the water comes to a rolling boil, blanch the tomatoes by gently placing them into the water and leave for 50 to 60 seconds. Remove from the water with a slotted spoon and immediately immerse in cold water. When the tomatoes are cool enough to handle, peel off the skin. Cut the peeled tomatoes into 1- to 1 1/2-inch cubes. Set aside. Put the soaked mustard seeds, vinegar they were soaked in, ginger, and garlic into a food processor and grind into a smooth paste. Set aside. Heat the mustard oil in a pot over low heat. When it is very hot, add the turmeric, cumin, and chili powder. Cook on low heat for five minutes, stirring often. Now add the peeled and cut tomatoes that have been drained of any excess liquid, the green chilies, the mustard-vinegar-ginger-garlic mixture, sugar, and salt. Continue to cook on low heat until the tomatoes become soft and pulpy. As this happens, the oil will begin to rise to the top of the mixture. This is a sign that the kasundi is well done. Taste and add more salt according to preference or if needed. Remove from the heat and carefully transfer hot kasundi into dry sterilized bottles. Top up with mustard oil. Cover with sterilized lids and process in a water bath for 10 minutes. Remove from water and let cool on a towel on a flat surface. When you hear the lids pop, you know the jars have been safely canned. Screw on the bands and let sit in a cool, dark place for four weeks for best flavor before trying, and for up to one year for longer storage. Once opened, a bottle of Kasundi can be stored in the fridge for up to three months. If you don't plan to can your kasundi, cool it completely and place it in a covered container in the refrigerator for up to four weeks.